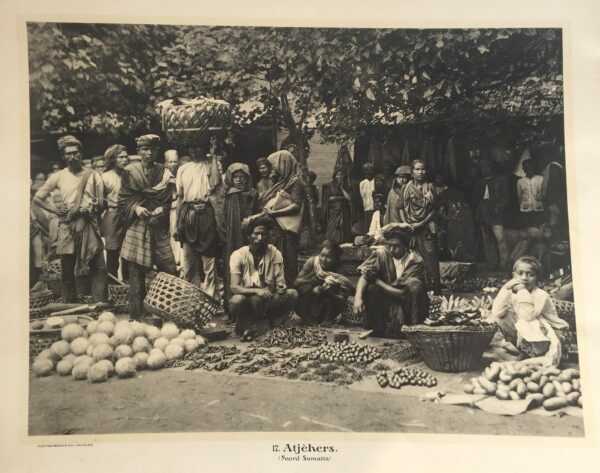 Tags: Aceh, Antique Print, Asia, Sumatra. A portrait of people at a marketplace in the district of Aceh (a stronghold of of fundamental Islam at the northern tip of Sumatra) reveals some distinctive differences in their features that Dutch chroniclers attributed to “immigration.” That was probably a reference to the influx and inter-marriage of ethnic groups from the Malay Peninsula, China, India, Sri Lanka (them known as Ceylon) and Arabs from the Middle East. Their dress also exhibits the multiracial mix local head cloths and sarong, Western shirts and trousers for the men, and blouses and sarongs, sometimes worm will long pants, by the women. A sarong on the shoulders was used as protection against the elements. The Acehnese are noted for their fine weaving in which silver and gold threads are used in intricate patterns to make for a rich gloss, a more refined technique than that of the Minangkabau people to the southwest where the gold and silver threads are clearly visible in the fabrics.